Make a Microloan for 6-yr old Christian's Health! One of Michael's Christmas presents was a marble maze. We'd actually had it for a while, but he just wasn't ready for it. Or, we weren't ready to have marbles all over the house. I have never seen him so excited over a present. As soon as we took everything out of the box and started assembling it, he wanted to help. He wanted to put things together, to build the track, everything. Once we had it all together, he was fascinated. In all, he probably had over 3 hours of appropriate play with a toy. I am totally amazed! We made these pancakes for breakfast today and they turned out really well. They actually rose, and tasted yummy. Michael ate 3!! Mix wet ingredients in medium bowl. Whisk dry ingredients together in larger bowl. Pour wet ingredients into dry and mix until smooth. Pour onto heated griddle, flip when pancakes bubble on top. As you know from my pre-Christmas posts, I was dreading the holidays this year. Michael has been so unpredictable lately; I was just convinced it would be terrible. Boy was I wrong! This has to be the very best Christmas ever. We went to PA to visit my side of the family – my parents, brother, and aunt. Michael was genuinely happy to see everyone, and had absolutely wonderful behavior the whole time we were there. A couple grumps when he was hungry, but not one meltdown. I was so proud of him! When it was time to open presents, I expected him to run and hide. Last year, he didn't want anything to do with unwrapping, and got very upset when anyone suggested opening his packages. We ended up unwrapping his presents when he was asleep and doling them out over a few weeks. This year, he helped pass out presents, and was excited when one had his name on it. He opened all his presents happily, and was really excited over several toys. It was wonderful to see him so gracious and fully engaged in the whole process. We had a mini Christmas with Steve's family today, and it went equally well. He was really excited to hear that his 'other favorite family members' were coming over. He was bouncing all over the place while we opened presents, but he did manage to open his with the same amount of grace and fun as he did at my parents. The best part was he invited everyone into the family room, which is 'his' room. And, he asked if they could come back tomorrow. It's the most social I've ever seen him. Oh! And an even better part. We gave his cousins little jelly belly ice cream cones. They looked and sounded just like maracas. Michael wanted to go downstairs and bring up his percussion box. He handed out different percussion instruments for everyone to play. He was actually happy to be sharing his 'toys'!!! And he didn't care that other people were playing with them and making noise. Then, he switched the instruments around and did it again. It was absolutely amazing. One last thing – we've been working on cleaning up before bedtime forever. Tonight, he cleaned up all his toys when I reminded him. Then, completely on his own, he went and put his kitchen stool away and turned out the lights in the dining room. I was completely floored. I don't know what has gotten into him, but I couldn't be more thrilled. Needless to say, I am crying with happiness as I type this. I'd write more, but I am having trouble seeing the screen. I'll be away from the blog for a few days for the holiday, so I wanted to wish you all a Merry Christmas now. I received this poem in my email today and it was just so fitting I had to repost it! Or even, maybe, a smile? Just from flapping his hands. You must learn to parent..."
He told his first lie! He did not cause a scene! More than words can say. Michael had a fantastic day today – he had his best day ever at school, he received his Project Lifesaver transmitter after school with no fussing, and he had a great time at his auditory integration therapy. So why am I so depressed? I feel so fortunate that we were able to get the transmitter, but depressed that we still really need it. I guess part of it is that we work so hard to get him all the biomedical interventions he needs, and we still have so far to go. I keep reading stories of children who do biomed for a few months and have miraculous recoveries. Even if they aren't able to lose their diagnosis, they can mainstream at school and participate in family functions. I'm struggling so hard to find an appropriate placement for Michael, and he still has really bad days as often as good ones. I know I shouldn't complain, and I am truly grateful for all the progress we've seen. It's so hard to read about children enjoying the holidays and knowing that I am dreading this holiday more than any other. Kids are supposed to like this time of year. And there are things that Michael loves – the winter lights, baking cookies, and spending time with family. But, he doesn't really 'get' the whole gift exchange thing, and is just as likely to melt down over a present being opened as enjoy it. And, even though he had a lot of fun decorating the tree, he won't let me turn the lights on to enjoy it. But, we take one day at a time, and it will eventually get better, right? Gradually add flour mixture to main mix until well blended. Dough will be crumbly but sticks together when compressed (hard). Divide dough into pieces about the size of a large burger patty. Roll out between two pieces of parchment paper. (It's more of a press than a roll.) The dough is oily enough that it does not need to be floured. 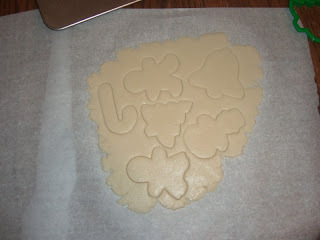 Press out shapes and gently remove excess dough. 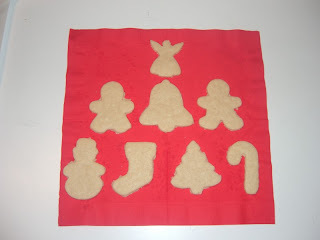 Leave on the parchment paper and transfer sheet to cookie tray. If you try to remove them to a tray for baking, they will fall apart. Bake at 350 for 11-12 minutes. Let cool on tray for several minutes. 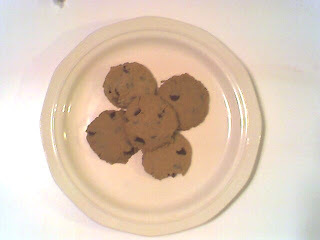 Again, transfer cookies on the parchment paper to a cooling rack. Cookies will be more sturdy once cooled. Today was a really, really good day. Michael tried really hard to amuse himself until 7:30, letting me sleep in a bit. The morning was pretty standard, with very little fussing. Once Steve had done the things he needed to do in the morning, he, Michael and Dan went out to the park to play and throw airplanes. It was cold, but Michael had a lot of fun, and great behavior! While they were gone, I started cleaning the kitchen. It was a big job! When they got home, Michael played with Uncle Dan while Steve and I finished working in the kitchen. Of course, as soon as we finished, Michael wanted to make Christmas cookies. They turned out really well, and we all had a great time making them. I'll attach the recipe as a separate post. I really like using the Tom Sawyer Gluten Free flour. It has a nice mix of flours, and doesn't leave an aftertaste. When we got to the cookie eating part of the evening, I tried really hard to tell the difference between these cookies and those made with wheat flour. I couldn't. I'm really sold of this flour! So, I'm probably jinxing myself, but it really was a wonderful day! CNN has decided not to feature the Generation Rescue team tonight, choosing to air a repeat instead. I can only imagine what pressure they caved to, but I am really disappointed that a news organization would back away from such an important interview. What ever happened to hearing all sides of an issue? Please watch Larry King Live on CNN tomorrow night 12/20 9PM EST, 6PMPST. "Jenny McCarthy, JB Handley and Stan Kurtz will appear on Larry King Live Saturday at 9pm eastern, 6pm pacific. The show is focused on autism with very direct discussions about vaccines, how to lower your risks of having a child with autism and how to effectively treat children with autism for their medical issues." I woke up to some great news in my email this morning. One of the loans we had given through Lend4Health had been fully repaid. There was $25 sitting in my paypal account! I am so excited that our small loan was able to help one child, and that we can now recycle the money to help another child. The only bad news is that there aren't any current loan requests. I talked with Tori a little bit this morning via email, and she said she would really like to see an influx of new loan applications. The more applications she gets, the more children can get loans. So, if you are a parent who is struggling to pay for your child's biomedical treatments, or looking for a way to avoid high interest credit cards and/or creative financing, now is a perfect time to put in a request. Tori really wants people to know that Lend4Health is for everyone, not just those in desperate financial straights. For those of us who really do have to get creative to get our kids the treatment they need, or who have been putting treatments off until money becomes available, this is a great option. From what I can tell, the process is very simple: just fill out the request on the website (you do not need to provide any financial information); Tori checks references; and she disperses the funds. Smaller loans ($500 or less) seem to get funded the fastest, but I have seen larger loans go through as well. Also, if you are interested in becoming a sponsor of Lend4Health, I know Tori has a ton of ways you can help. This time of year, it always seems like a good idea! It must be Holiday time because we seem to be baking a lot. This tastes extra yummy and it pretty easy to make. Let me know what you think? the shortening melts and the mixture just starts to bubble. Immediately pour mixture over chocolate/sugar/cocoa mix. Let sit for a few minutes so the chips melt. Stir until blended. If the chips aren't completely melted, put in the microwave for 30 seconds. Stir in vanilla and pour into baking pan. Smooth out the top and corners. Let cool completely before cutting. I haven't mentioned Lend 4 Health in a while. There is a loan out that is only 65 dollars away from being funded. (Thank you Petra for pointing this out!!) If any of you wanted to lend just 5 or ten dollars, we could get Ethan his tests so he can get the treatments he needs. Please think about it! It's a cheap and easy way to make a difference for a child who has parents trying to help him. UPDATE!!! An anonymous poster lent the rest of the money for Ethan's loan. Now, that's a holiday present!! If you know of anyone who needs help paying for biomedical treatments, I know Tori is looking for the next loans to put up. Just go to Lend 4 Health's application form to apply. Michael woke Steve up this morning to bake chocolate chip cookies. It is so nice to see him want to bake, even if his timing isn't the greatest. He loves gathering the ingredients, measuring and pouring. He's not quite so good at preparing the work area or cleaning up. Now that the cookie recipe is pretty much finalized, I thought I'd share it. If you try the cookies, please let me know how they turn out for you? Dough can be refrigerated for several days, easier to work with when cold. The first article today made me sad, this one just makes me angry. When people ask me why I don't support autism speaks, it's hard for me to put my feelings into words. Katie Wright is so eloquent, and the facts really do speak for themselves. We've been dealing with Michael's autism for a while now, and I've read my share of parent stories. But, for some reason, this one made me cry. At work. (But, during lunch at least) I guess it's just harder to see how autism affects those that we generally regard as super strong. I really hope that Captain Mickley is able to pull together a group of parents, and can finally get their voices heard. I came across this article in my readings and wanted to share it. It's a bit technical, but very interesting. Also, today's Age of Autism is discussing the fact that the DTaP / Autism corrolation that was on DoD websites last week is now missing. Very suspicious. I'm sorry that I'm not posting as much about Michael lately. He's been having some really great days, and some really terrible ones. Right now I'm just physically and mentally exhausted. We have some big things coming up this week, both at home and at work. I am hoping to back to a better posting schedule by the end of the week. Michael had a really great day today. I gave him a toy that he's had for a few years, but never played with. 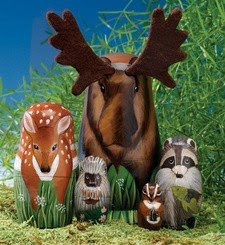 It is a nesting woodland animals set, similar to the classic Matryoshka dolls. He spent much of the day taking them apart and putting them back together and trying to figure out how to line the top and bottom up correctly. It was so nice to have him play appropriately with a toy for so long. What was even better is that he wanted to interact with us and the toy. He'd bring the animals over, sit in my lap, and ask me to help when the pieces were stuck, and just generally talk about the animals when he wanted to make conversation. Additionally, he helped a lot with making his cookies and cleaning up. Definitely a great day! The Pentagon -- A Voice of Reason on Vaccines and Autism? Definitely an article you will want to read for yourself! Presenter Dr. Devin Houston has an extensive background in enzyme research and is the inventor of several enzyme-based products. Attendees will be able to type questions for Dr. Houston. I've been talking with a lot of people lately about the enzymes that Michael takes and why he takes them. I thought it would make the most sense to just write this out here and hope it reaches as many people as possible. When Michael was first diagnosed with autism, we heard about the Gluten free/Casein free diet as a possible treatment. He was so limited in the foods he was willing to eat, and so underweight, I wasn't willing to further limit his diet at the time. I heard about a book, Enzymes for Autism and Other Neurological Conditions, and decided to try the enzymes instead of the diet. There is a wonderful yahoo support group for people reading the book and using enzymes. There are three enzymes that we give him: AFP Peptizide, Zyme Prime, and No Phenol, all produced by Houston Enzymes. AFP Peptizide helps break down gluten, casein, and soy proteins. It is really the enzyme that can help instead of removing these foods from the diet. However, if your child is allergic to any of these proteins, or has celiac disease, the enzymes cannot replace removal of the foods. Zyme Prime helps with the digestion of carbohydrates and fats. If your child is lactose intolerant, this enzyme can help digest the lactose (a sugar/carbohydrate). No Phenol helps digest fruits and vegetables. Michael has a strong hyper reaction to bananas, but if we give him this enzyme with bananas, he can tolerate them just fine. It also seems to help with any food coloring in his food. When we first started, Michael was unable to swallow capsules, so we bought the powdered version of the enzymes and mixed it with juice. You have to be careful to only mix right before giving the enzymes to your child. Otherwise, the enzymes will act on the juice and spoil it. Now that Michael can swallow capsules, we get one product, Trienza. Two capsules of this product combines one dose of AFP Peptizide, one dose of Zyme Prime, and a half dose of No Phenol. If Michael is eating a lot of fruits/vegetables with a meal, we will give him an additional No Phenol capsule. I love that Dr. Houston is so responsive to the needs of our children. His products are safe, and he is responsive. The website is great resource to understand how enzymes work for our kids, and he is a genuinely caring person. He came out to a parent group meeting I attended at his own cost, gave a thorough presentation, and answered all our questions. It was just obvious that he cares about our kids. I appreciate that. After taking the enzymes for over 3 years, we decided to try Michael on the GFCF diet. Most children who have problems with Milk also have problems with soy, so we eliminated that as well. We also started to see Dr. Megson. We saw wonderful results with the diet, and Dr. Megson ran blood tests that indicated Michael is allergic to Wheat, Egg, and Peanut. Since the enzymes cannot help with physical allergies, it made sense that Michael was so responsive to the diet. Since there seems to be a yahoo group for everything, I highly recommend the GFCF Kids group, for information about the diet and pretty much everything biomedical/autism related. The last question people ask is why Michael still takes the enzymes even with the diet. The short answer is to be safe. His digestive system is such a fragile thing, we don't want to take any chances on cross contamination, or him eating something he isn't supposed to. By taking the enzymes before eating, we have an extra level of digestive safety. I hope this helps with any questions you have about Michael's enzymes. If not, please leave a comment or send me an email. Michael is always my favorite topic! I'm not really one to beg for help, but these days money is getting tighter and Michael's therapy is getting more and more expensive. We had hopes that the county would help with funding for a FAR Infrared Sauna, but that doesn't look like it's going to happen. The sauna would help us remove toxins from Michael's body - from vaccines, pesticide, everyday exposure. If you are feeling generous and would like to contribute, I'd really appreciate it. If we actually get the sauna, I'll definitely keep you up to date on whatever results we see.